Townsquare Media and Spectra by Comcast Spectacor, which provides Venue Management and Food Services & Hospitality to Atlantic City’s Boardwalk Hall and the Convention Center, have partnered together to bring the biggest kid’s festival in South Jersey to Boardwalk Hall. 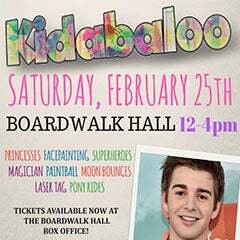 Kidabaloo, presented by AtlanticCare, makes its debut appearance at the historic arena on Saturday, February 25 at 12pm. Tickets to the event which features non-stop entertainment and promises a full day of laughs for the whole family are just $10 for General Admission, $35 for Family 4-Packs, and $75 for VIP Tickets and can be purchased at Ticketmaster.com, by calling, 800-736-1420, or visiting the Boardwalk Hall Box Office powered by Atlantic City Electric. Groups of 10+ can save even more by calling 609.348.7022. This year will feature an additional designated area for children with special needs presented by Interactive Kids of Cherry Hill and Northfield. This ‘Inclusive Activity Area’ will include activities like: Wii baseball, dance party, yoga, crafts, games, spin art, and a quiet tent. Interactive Kids offers a wide array of behavioral, educational, and vocational-based services for individuals with disabilities such as autism, developmental disorders, non-verbal learning disorder, brain injury, ADD/ADHD, behavior disorders, and other neurological impairments. Check out everything coming to Kidabaloo! AtlantiCare – Meet AtlantiCare pediatricians and NICU nurses! You can also check out their Healthy Schools Healthy Kids Cooking Demonstration and sample some healthy snacks! ShopRite – Stop by and meet ShopRite’s registered dieticians! Jack Griffo- Meet and Greet with “Max” from Nickelodeon’s hit television show, The Thundermans. Get your picture taken with Jack Griffo thanks to Inspirephotos in Galloway. Absecon Home Depot – Design your own apron! Chubby Penguin Parties – Bringing along our favorite Nick Jr. characters from Peppa Pig and Paw Patrol! They’ll also have face painting, glitter tattoos and balloon twists! JenniCakes – Decorate your own cupcake! Let’s Party Painters – They’re bringing their Disney Princesses, Star Wars characters and Superheroes and a whole team of face painters! Superhero Squad & Superhero Training – Meet your favorite Superheroes and take the Superhero Pledge! Star Wars: The Power of the Force – Meet your favorite Star Wars characters and participate in light saber training! Townsquare is a media, entertainment and digital marketing solutions company principally focused on small and mid-sized markets across the U.S. Our assets include 310 radio stations and more than 325 local websites in 66 U.S. markets, approximately 550 live events with nearly 18 million attendees each year in the U.S. and Canada, a digital marketing solutions company serving approximately 8,000 small to medium sized businesses, and one of the largest digital advertising networks focused on music and entertainment reaching more than 60 million unique visitors each month. Our brands include iconic local media assets such as WYRK, KLAQ, K2 and NJ101.5; acclaimed music festivals such as Mountain Jam, WE Fest and the Taste of Country Music Festival; unique touring lifestyle and entertainment events such as the America on Tap craft beer festival series, the Insane Inflatable 5K obstacle race series and North American Midway Entertainment, North America’s largest mobile amusement company; and leading tastemaker music and entertainment owned and affiliated websites such as XXL.com, TasteofCountry.com, Loudwire.com, JustJared.com and BrooklynVegan.com. For additional information, please visit www.townsquaremedia.com.